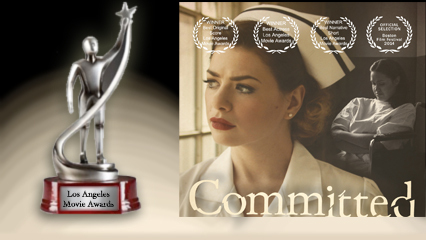 Committed, the short film by Llana Barron and Mehran Torgoley has won its first 4 awards this season from The Los Angeles Movie Awards. 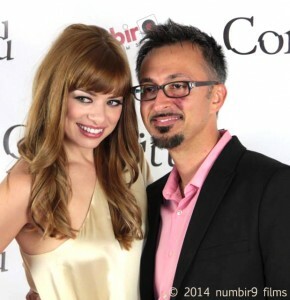 The film has received “Best Narrative Short” and the “Audience Choice Award”, and Barron came away with two of her own awards for “Best Actress” and “Best Original Score”. This is her second award for original music in a film and her first ever for acting. The Los Angeles Movie Awards (LAMA) screened the film for the public in Hollywood on Saturday, September 27th at 6:45 PM. The awards ceremony, which was attended by a number of “Committed” cast and crew members followed. The film was extremely well received. 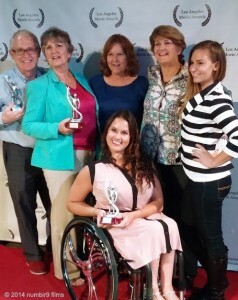 The awards were accepted on behalf of Numbir9 Films and Llana Barron by supporting actors, John Copeland, Santina Muha, and Joanne Atkinson.